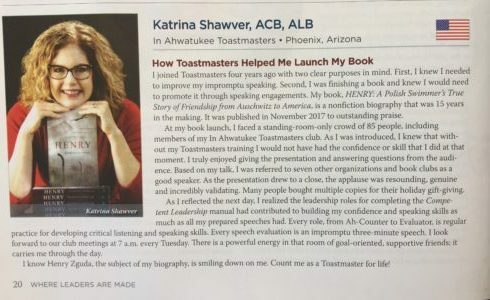 February 21, 2019, Koehler Books, “An Interview with Katrina Shawver.” Click here to read. February 16, 2019, Ahwatukee Foothills News, “Library features local author as ‘writer in residence. '” Click here to read. February 11, 2019, YourValley.net, “Writer in Residence to host appointments at Glendale library.” Click here to read. 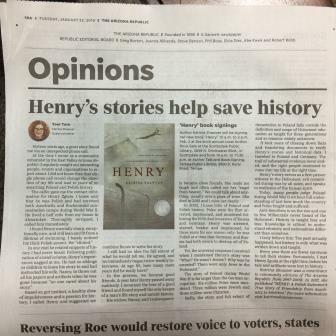 January 22, 2019, Arizona Republic, “Henry’s Stories Help Save History.” Click here to read. January 22, 2019, Ahwatukee Foothills News, “Book on Ahwatukee concentration camp survivor earns plaudits.” Click here to read. November 30, 2018, Ahwatukee Foothills News, “Ahwatukee author’s book wins Polish Congress accolade.” Click here to read. November 29, 2018, IBPA Member Spotlight: Katrina Shawver: “Katrina Shawver Honored With 2018 Polish Heritage Award for Her Novel About Holocaust Survivor Henry Zguda” Click here to read. July 2018, Nonfiction Authors Association, “Bringing Someone Else’s Story to Life.” Click here. July 2018, VoyagePhoenix online magazine. “Trailblazers: Life and Work of Katrina Shawver.” Click here to read. 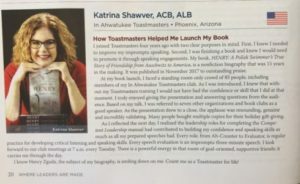 June 2018, Toastmasters International magazine (private publication so no link available). April 23, 2018, Blogtalk Radio with Cyrus Webb of #ConversationsLIVE. Click here to listen to great interview. April, 2018, Arizona Jewish Life magazine, “Women Who Lead.” Click here to read. March 27, 2018, My Book Place, Author Interview. Click here to read. March 23, 2018, Ahwatukee Foothills News, “More Honors for Author’s Book on Nazis Camp Survivor” Click here to read. March 21, 2018, The Foothills Focus “The Power of the Written Word.” Click here to read. March 16, 2018, The Am-Pol Eagle (Buffalo NY) Click here to read. February 7, 2018, radio interview “Off the Record with Judy.” Click here for full interview. January 22, 2018, Advicesbooks.com (Italian book review site) Literary Prize for Best Book Read in 2017, category New Authors. Click here to read. Films and books that feature WWII, the Holocaust, and Nazis, will always hold interest for millions of people. What is a more recognizable enemy than Hitler and Nazis? 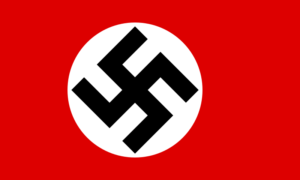 The Holocaust and the rise and fall of the Nazi party hold a unique place in modern history as the most widely documented genocide and sinister enemy. Why? Meticulous German recordkeeping, thousands of memoirs and reference materials, and international institutions and museums dedicated to remembering the Holocaust. Consider how film and books treat World War II history.